Our mother, Emily Hahn, was a dazzling, beautiful adventurer and writer. She had spent some time in Hollywood as a screenwriter and then, on a trip around she discovered Shanghai. She stayed in China for 9 years, teaching and writing. She had a love affair there with a Chinese poet and when this relationship deteriorated she met my father who was stationed in Hong Kong as a British intelligence officer. I was born from this passion. At the behest of my father, who feared for our lives and who had been imprisoned by the Japanese after being badly wounded in the battle of Hong Kong, my mother and I took a refugee ship to New York. We were joined there by my father after Japan surrendered at the end of World War II and he was able to escape from his prison camp when the prison guards abandoned it. While my mother survived some war years in Hong Kong, she told me that a fur lined chinese robe kept her warm through savage weather and deprivations of food and heat. My mother was not vain and she enjoyed a life of the mind. 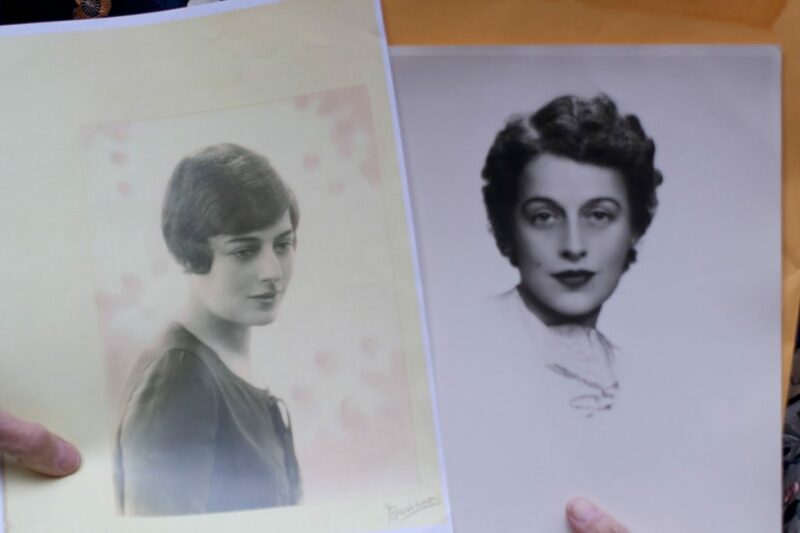 Still, her glamor and beauty touched me I remember the gifts my mother would bring back to my sister and me from New York. We lived in England at this time, after my father came to get us in New York and bring us to his home in the English countryside. She brought us dresses. My favorites were a billowy skirted white dress with red roses scattered over it and a persian turquoise summer dress spangled with gold stars. These dresses remain in my memory linked to Rome, city of gold and apricot, where my mother had taken me at the perfect age of 14, for a Roman holiday! A few days ago I shared the photo above in a post about self expression.It’s always lovely meeting people on the street and starting up a conversation. 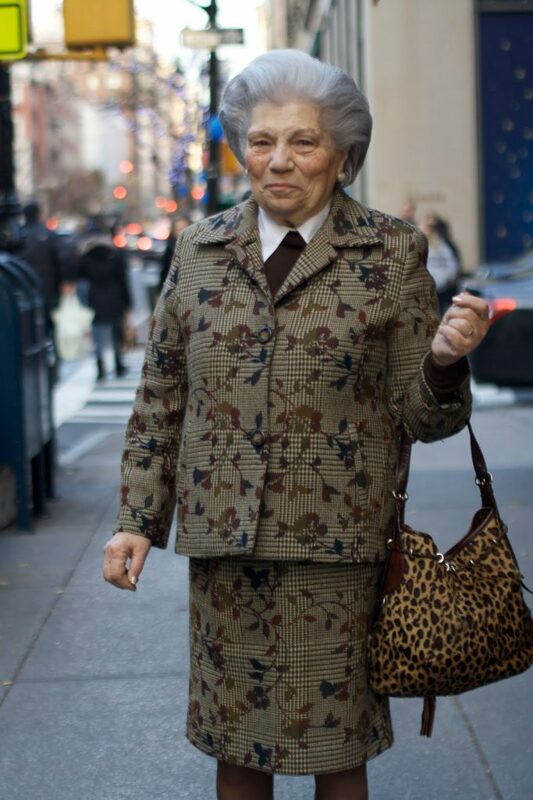 I stopped this stunning woman on Madison Ave and we chatted for a few moments.She asked what I do and I told her that I was working on a book about age and style. She told me that she is teacher for disabled children and that she will look for the book when it comes out. When I need a little bit of cheering up I call up my great friend Ilona Royce Smithkin. She always has the best advice and helps me to put things into perspective. The other day we were having lunch and I was showing her all the comments on a post I had done about her. She loves the fact that she can share her lifetime of experience with others. Ilona is an artist, a teacher, and a style icon. She wanted to share a few words with anyone who is having a hard day, so we made the short video above. If you want to tell Ilona anything feel free to comment here or on my facebook site HERE . I love any company that considers smart design when making products for older people. I remember going out to help my grandmother buy a cane and all we could find were those grey and silver, very clinical looking, walking sticks. My grandma Bluma loved color. She felt that as long as she needed a cane, that she should find something beautiful that would lift her spirits. My mother and I always considered this when we would go out shopping for her. 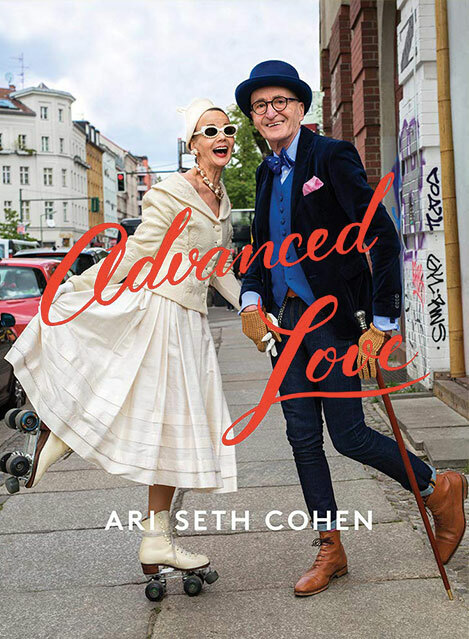 The ladies and gentleman of Advanced Style have offered proof that style advances with time. Wouldn’t they want their canes, walkers, and other aids for daily life, to be just as stylish as their carefully coordinated accessories? 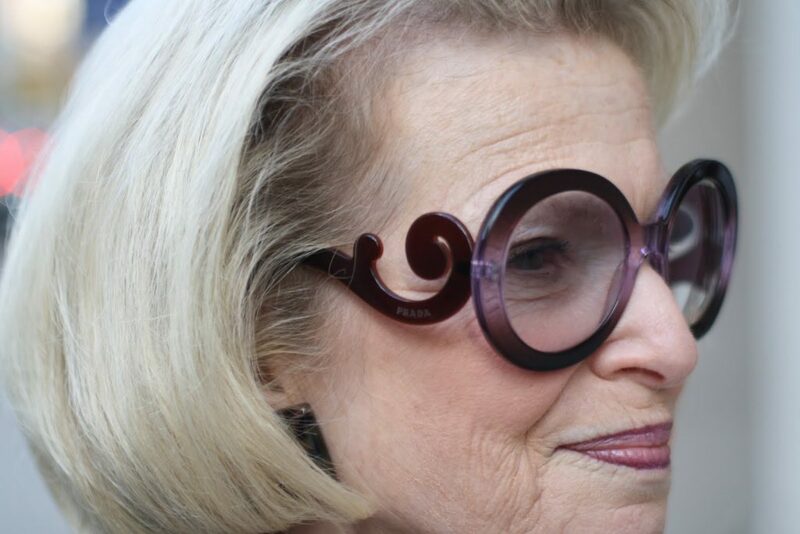 This is why I was thrilled when I first heard about Omhu, a wonderful company offering groundbreaking designs to support people’s abilities as they change throughout life.I had the great opportunity to shoot Lynn Dell, “The Countess of Glamour” modelling one of their stylish canes in the ad above. 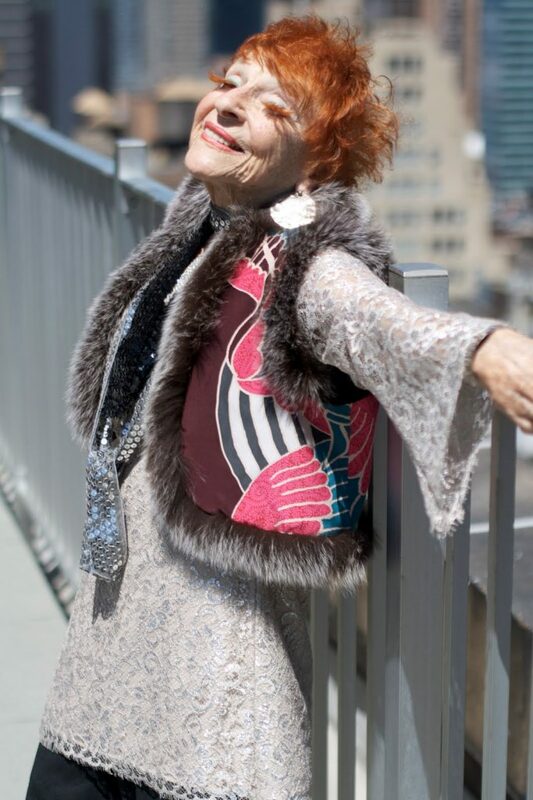 At 78 Lynn Dell knows what works best for her.When it comes to style she says,”I like strong colors and I like strong people. 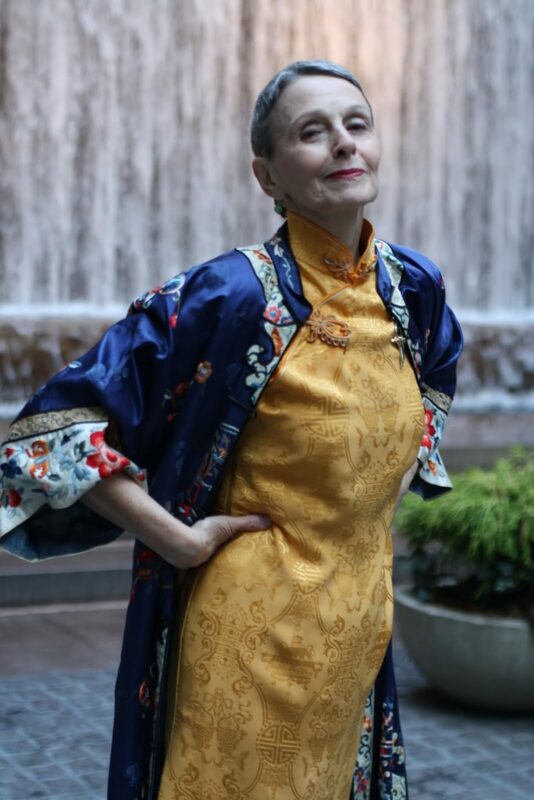 All colors work if the intensity is strong enough.” The bold color and sleek design of the Omhu cane suit Lynn Dell’s style philosophy perfectly. 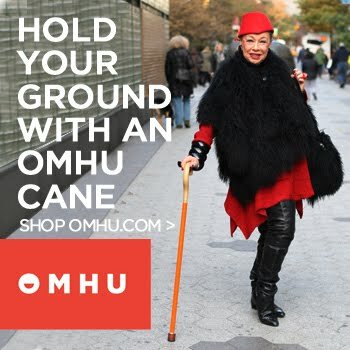 If you would like to order one of the Omhu canes,available in six different colors, they are offering free shipping for the month of December. Check out some more great holiday gifts at http://omhu.com/ and enjoy more of Lynn Dell’s style below .